Magnus Carlsen, the winner of the 2017 Grand Chess Tour, tops the list of invitees for the 2018 tour. The organizers have announced both the list of 10 invited players and the dates in a press release. Can Howell Be James Bond At Gibraltar Chess? In 2015, GM Hikaru Nakamura threatened to run away with the Tradewise Gibraltar Chess Festival, starting 6-0. Just when it looked like his seventh win was coming, a late slip allowed GM David Howell to draw. The Grand Chess Tour (GCT) is pleased to announce the list of players that have been invited to participate as full tour participants for the 2018 GCT. The 2018 GCT event dates and tour point regulations have also now been finalized and are detailed below. GM Viswanathan Anand was selected by the GCT Advisory Board after taking account of his status as a former World Champion and as the reigning World Rapid Chess Champion. GM Anand was also ranked 9th per the Average FIDE Classical Ratings and 11th according to the URS™ rating list as at 1 January 2018. The 2018 London Chess Classic & GCT Tour Finals will take place on dates still to be confirmed during the period between December 10, 2018, and December 21, 2018, in London, UK. Find the Winning Moves – Can you do as well as the players at the London Chess Classic? Christmas Quiz Solutions – How did you fare with Charles Higgie’s festive puzzles? The post CHESS Magazine – February 2018 appeared first on Chess.co.uk. Magnus Carlsen has won the Tata Steel Chess Tournament, after an exciting last round. At the start of the matches five grandmasters still stood a chance of winning, with Giri and Carlsen jointly leading the pack. Because both their games ended in a draw, they had to play a tie-break, consisting of two blitz games (five minutes for each player, with 3 extra seconds per move), which was won by Carlsen. The final round was opened by former world champion Anatoli Karpov and Judit Polgar. Vidit Gujrathi (India) has won the Tata Steel Challengers, thus earning a promotion to the Tata Steel Masters 2019. Stefan Kuipers has won the Top Nine Round event, earning a spot in the Tata Steel Challengers next year. The Tata Steel Chess Tournament 2019 will take place from 11-27 January 2019. 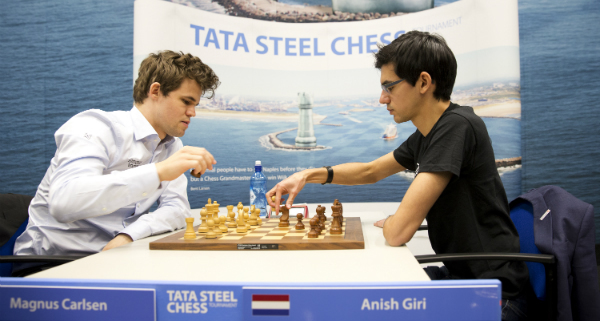 For info about the Tata Steel Chess Tournament, go to: www.tatasteelchess.com. Thailand Chess Association (TCA) in cooperation with Bangapi Chess Club on behalf of the Asian Chess Federation (ACF) have the honour to officially invite all Asian national chess federations to participate in the 2018 Asian Youth Chess Championship and Asian Youth Rapid and Blitz Championships, which will be held in Chiangmai, Thailand. This event will be held from 31st March (arrival) to 10th April (departure). Every Asian national chess federation can register only one official player in each category. Maximum of 12 players. Other than Official Players, players shall be classified as Additional Players. A FIDE endorsed chess academy can send its trainees (maximum one player per category) as Additional Players. All persons, besides the players, shall be classified as Accompanying Persons. A federation may register any number of Additional Players and Accompanying Persons but only upon confirmation of availability by the Organizing Committee (OC). The National Federation shall be responsible for the costs of their Additional Players and Accompanying Persons. 1. Each participant (official or additional player and accompanying person) must pay registration fee of USD125 to the OC before 1st February 2018 – the Registration deadline. This registration fee is compulsory and represents a confirmation of participation and includes accreditation and transportation from and to Chiangmai International airport. 2. After the Registration deadline no official players will be accepted and their application will be treated as additional players. Also organizer reserve the right to refuse late registration or accepting with penalty charge of USD100 for each registration. 3. Registration form must be filled by National Federation officials and delivered to the OC before registration deadline. 4. All the travel expenses must be paid by the participants or their Federation. Only member federations of ACF are entitled to submit registration forms. Individual applications will not be accepted. 5. For security and organizational reasons and in accordance with FIDE tournament regulations all national delegations shall use the official hotel(s) designated by the OC. The Official Hotel and Official Venue of the event is the Lotus Pang Suan Kaew, (four stars) which is about 20 minutes from the international airport. 2. The rate of play will be: 90 minutes for the whole game with an increment of 30 seconds per move starting from move one. In case the above still does not produce a decision, the players remaining tied will be proclaimed joint winners. 4. The Continental President for Asia will – after consultation with the organizing federation – nominate the Technical Delegate and Chief Arbiter, as well as the necessary assistant arbiters and other officials. 1. Top 10 players in each event will be awarded: first three places Gold, Silver and Bronze medals and Trophies. 4th to 10th places will be awarded medals and special prizes. 2. Three best Federations, by ranking of medals collected in all categories, will receive a trophy. For first place the number of gold medals will be taken under consideration, if there is a tie, then the number of silver medals, if there isstill a tie, then the number of bronze medals. If finally this is still equal, then the total number of medal winners. 3. The champions of AYCC-2018 shall have the personal right to participate in the World Youth Championship of the corresponding age-category or a higher age-category if the stipulation of Art. 1 is met. This privilege may be exercised once exclusively in the subsequent year following the year of qualification. 4. Certificates of Participation shall be given to all players, FIDE accredited trainers, Managers, and the appointed Technical Officials. 1. FIDE direct title regulations have been amended effective 1st July 2017. Award of direct titles are now based on the minimum rating requirements as published in the FIDE handbook. Notice of these minimum ratings will be posted at the venue. Those who do not meet these requirements shall be awarded these titles on reaching the necessary rating, at any time. 2. Winners of U18 categories shall be awarded the title of International Master (IM) / Woman International Master(WIM). 1st equal player shall get IM norm. The Silver & Bronze Medal winners shall be awarded the FIDE Master (FM) / Woman FIDE Master (WFM) title. 3. Winners of U16 category shall be awarded the title of FM / WFM and an IM norm. 1st equal player will get FM title. The Silver & Bronze Medal winners shall be awarded the Candidate Master (CM) / Woman Candidate Master (WCM) title. 4. Winners of U12 & U14 categories shall be awarded the title of FM / WFM. The Silver & Bronze Medal winners shall be awarded the CM / WCM title. 5. Gold, Silver & Bronze Medal (after tiebreak up to 3 players) winners of the U8 & U10 categories shall be awarded the CM/WCM title. This year the grandmaster from Moscow, graduator of the RSSU, Alina Kashlinskaya is playing in the Moscow Open Women’s Cup of Russia tournament in the status of a ranking favorite. She is the first guest of the tournament press-center and is kind to answer our questions. - Hello, Alina! Do you remember how many times you played in the Moscow Open? - I played many times in the RSSU Cup, won’t be able to name the exact number offhand. In 2009 I fulfilled the standards of the international master level by playing in the A tournament (now it’s called the Men’s Cup of Russia tournament – editorial note). Then I played in the round-robin student competitions, and in recent years I’ve been playing in the grand Swiss-system tournament – the Women’s Cup of Russia event. A couple of years ago I was leading the competition with a 100% result after six rounds, but as a result shared 2-4 places, and was placed forth according to the tie-breaks. Last year I won a silver medal. - Why have you decided to play the Moscow Open this year? - I wanted to take part in a strong tournament, and also to spend some time with my family at home. Now my husband and I live in Poland. And I miss home-made meals that my mom cooks. Besides it’s nice to start a chess season with such a strong competition. - You won the third place in the last Superfinal of the Russian Championship. Are you satisfied with such a result? - It was my fifth Superfinal in a row, and I had a goal to show a worth result. I didn’t have any idea that I would go there to win only a gold medal. My experience says such argumentation never lead to big results. 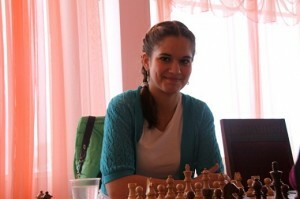 However, I faced a crucial moment in the first round – I managed to beat a very difficult opponent – Valentina Gunina. I felt, luck would accompany me in this tournament. It was also funny that at the draw I pulled out the number that provided me with more games with black. I was upset a little bit but Olga Girya calmed me – one of the tie-breaks is a number of games played with black – so it would serve for better! And it turned out so that I shared 3-4 places with her, and finally took a bronze medal thanks to the number of more games played with black. Of course, I was happy with the result. - How do you spend time during the tournament, what are you doing after games? - Usually I read books or watch one episode of some serial. Previously I never watched serials, but my husband and many of my friends persuaded me to try. Now in my daily life I’m trying to limit myself, but once I lost control and managed to watch 16 episodes in one day! Now serials serve as a small bonus – I switch them on after my daily plan is fulfilled. - What memories do you have about the studies in the RSSU? - I have very warm memories. Now when I live in another country I can compare. Our University provided us with all the possibilities to develop our skills if we are talking about chess: supported us morally, provided us with a free schedule… As a rule, chess players have to choose between sport and studies in other countries. And quite often the choice is done in favor of studies. In our case we have a chance to combine. - What goals do you have this year? What tournaments do you plan to play in? - In the nearest future I will go to the Women’s European Championship, and will also play in the round-robin tournament in Holland. I don’t like to define an exact goal, I’m more about advancing the level of my skills. It’s easier to play thinking like this. Of course there are people, who are able to win with an idea of victory in their minds, but I’m not in this number. I just play, develop myself, and I’m happy with this. 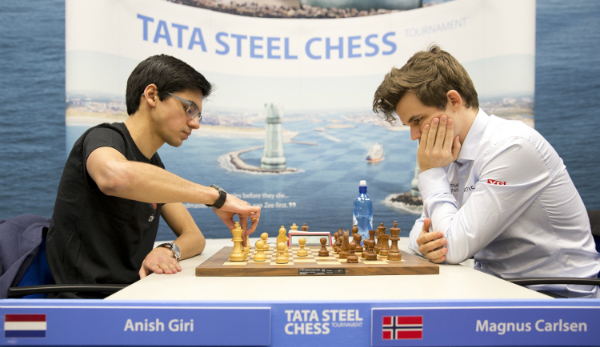 Tata Steel Chess: Carlsen Or Giri? 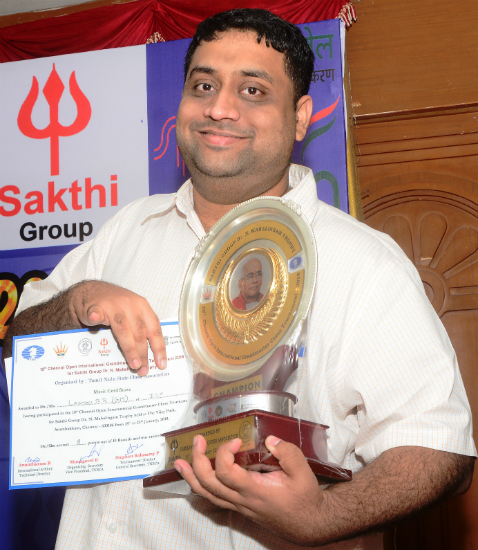 Grandmaster R R Laxman of ICF, Chennai, 8.0 points, emerged the Champion on a tie-break after the tenth and final round of the 10th Chennai Open International Grandmaster Chess tournament 2018 for Sakthi Group Dr N Mahalingam Trophy at The Vijay Park Hotel, Chennai here today. The five players sharing the podium, with 8/10 score, in their respective tie-break order of placement are: Laxman R R (India), Rozum Ivan (Russia), Gareyev Timur (USA), Dzhumaev Marat (Uzbekistan) and Erigaisi Arjun (India). Laxman, also a former Commonwealth Champion, takes home the winner’s purse of Rupees 200000 (Euros 2563) along with a glittering Chennai Open 2018 trophy. Top seed Gareyev’s defeat of second seed GM Rozum Ivan of Russia in the first board, ensured a five-way tie for the top. The tournament saw three Norms being made viz., Woman International Master Norm achieved by Woman FIDE Master C Lakshmi, International Master Norms achieved by Karthik Venkataraman and Nikhil Dixit respectively. Cash prizes to the tune of Rs 1100000 (Euros 14100) to top fifty finishers, were distributed by Shri Bharat Singh Chauhan, Hon. 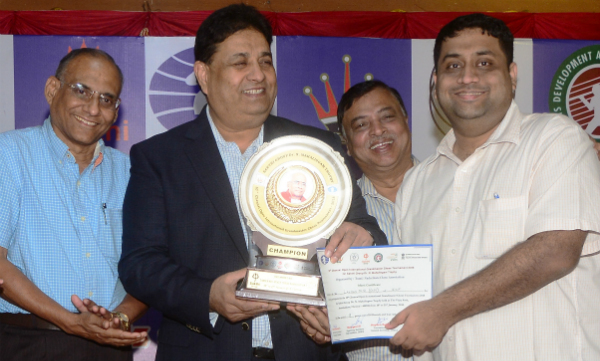 Secretary, All India Chess Federation. Present in the dais were Shri D V Sundar, Vice President, FIDE, Shri Manuel Aaron, Arjuna Awardee, Shri B Murugavel, Vice President, Tamil Nadu State Chess Association, Shri P Stephen Balasamy, General Secretary, Tamil Nadu State Chess Association. Important Results (Round 10) (Indians unless specified) : Gareyev Timur (USA) 8 bt Rozum Ivan (Rus) 8, Karthik Venkataraman (7) lost to Erigaisi Arjun (8), R R Laxman (8) bt Visakh N R (7), Llaneza Vega Marcos (Spa) 7 lost to Dzhumaev Marat (Uzb) 8, Sidhant Mohapatra (7.5) drew with Tukhaev Adam (Ukr) 7, Deepan Chakkravarthy J (7.5) bt Tiviakov Sergei (Ned) 6.5, Khusenkhojaev Muhammad (Tjk) 7 drew with Solodovnichenko Yuri (Ukr) 7, Raghunandan K S (7.5) bt Sivuk Vitaly (Ukr) 6.5, Deshmukh Anup (6.5) lost to Atalik Suat (Tur) 7.5, Pruijssers Roeland (Ned) 7.5 bt Nitin S (6.5), Karthikeyan P (6.5) lost to Rathnakaran K (7.5), Nguyen Duc Hoa (Vie) 7.5 bt Roy Chowdhury Saptarshi (6.5). You are currently browsing the Chess blog archives for January, 2018.